There is nothing quite like a calm morning on the water. Hearing the gentle splash as your paddle dips into the quiet waters, seeing your destination approach but not in any rush to get there because you know the journey is why you came. Whether by canoe or kayak, there is something magical about gliding through the water surrounded by the beauty of nature. 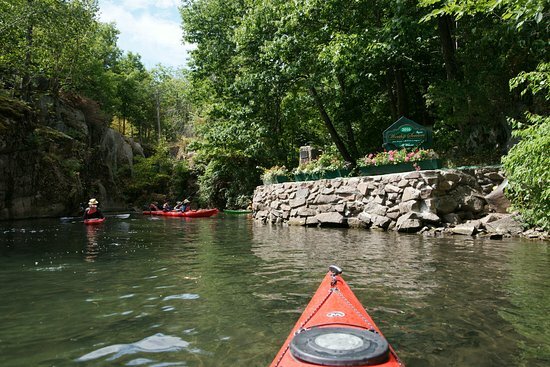 The Frontenac Arch Biosphere is an ideal place to tour by water. A spider web of rivers and canals connect cities, parks and historic sites to satisfy all level of adventurer. From calm lakes, to bustling canals and open water, here is a list of 13 Amazing Places you can explore with a paddle in your hand. The Rideau Canal is one of the best ways to travel the region by boat. With numerous towns to stop in along the way, you can turn a trip down the canal into a multi-day adventure that promises lots of detours. While you can start anywhere along the 202 km stretch, maximize the amazing by starting at Jones Falls near Elgin. This National Historic Site of Canada has a days worth of exploring on it’s own. Tour the locks and outbuilding or take a short hike along the trails. Start at the top and lock your way down or begin at the bottom in Whitefish Lake. Continue down the canal to Haskin’s Point in Seeley’s Bay. This point was once a vibrant trading post but now is a family friendly recreation site in the heart of this quiet but charming village. Farther south, pass through the Upper Brewers then the Lower Brewers Locks. While it may be small, the Lower Brewers Lock was once a major headache for the canal’s engineers due to sabotage from a disgruntled neighbor. Now it is a peaceful spot with beauty and culture living in harmony. Check Parks Canada website for schedules and fees. Most lockstations allow camping with a mooring permit and there are many Inns and B&B’s along the canal. If the open water of the St. Lawrence River calls to you, there are 7 Amazing Places along various stretches. Travel through Brockville and you can dock your boat on Blockhouse Island and tour Canada’s First Railway Tunnel and the learn about the area at the Aquatarium at Tall Ships Landing. Head west and the river will take you past Chimney Island, a small but important spot during the War of 1812. Paddle through the Thousand Islands National Park and explore Gordon Island for the day or camp for the night. Pass under the Thousand Island Bridge and stop at Hill Island for a trip to the top of the 1000 Islands Tower for a birds eye view of the river. Launch from Gananoque and take a spiritual journey to Half Moon Bay any day of the week but especially on Sunday afternoons for their open air worship services. Lastly, if your sites are set on Kingston, visit Fort Henry for a living history lesson in the Limestone City. A jewel in the crown of the biosphere reserve, Charleston Lake boasts 161 km of shoreline and more than 100 islands to explore. Blue Mountain Trail within Charleston Lake Provincial Park is best accessed by boat. Travel along the east side of the lake to Huckleberry Hollow then take the 3 km hike to the top for one of the best views in the area. The park’s Boathouse Cove is a quick walk from the Sandstone Island Trail, a 2.6 km interpretive trail where you will find the Gordon Rock Shelter and see the regions geologic history like nowhere else. Outside the park on the north side of the lake you can launch your boat from the village of Charleston and visit with Old Baldy, a natural rock formation known as the Guardian Spirit of the Lake as you glide past the rocky cliffs and through quiet bays. You can’t deny that the Frontenac Arch Biosphere has a lot to explore and there is no better way to do it than with a paddle in your hand. For more info and help planning your adventure, check out the Frontenac Arch Biosphere Network’s website for paddling trail descriptions complete with maps, and local outfitter that can help with everything from equipment rental to guided tours: 1000 Islands Kayaking, Ahoy Rentals, Rideau Tours, Charleston Lake Provincial Park Store, Gilbert Marine Ltd. Find all the listed Amazing Places and outfitters on this handy Map.